Nybbles from Albert: We're Going to PLAY! W00T! We're Going to PLAY! W00T! PLAY! 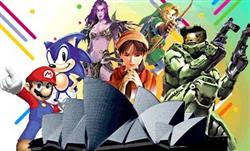 A Video Game Symphony comes to Australia. Saw the announcement from one of the mailing lists I subscribe to. Went to the Opera House's website, and there it was. June 19-23 at the Concert Hall. I quote: "Performed by the Sydney Symphony, conducted by Arnie Roth and backed by choral sensation Cantillation, PLAY! brings to life the award-winning music of the biggest and best games around – while massive screens, suspended over the orchestra, capture stunning gameplay sequences." Better still, the organizers are having a special weekend web offer. Instead of the regular ticket prices of $49, $59, or $69, you pay only $44 if you book your tickets during the weekend. I really wanted to buy the tickets, but the procrastinator in me forgot all about it till Monday morning. As I feared, the special offer is gone. Not one to give up easily, I searched around the Internet until I hit paydirt. Acting on a tip I picked up from the Atomic forums, I found out that there's a special last-minute offer for the concert. 500 tickets at $45 each - good only from Tuesday till Thursday. Simply quote 'GAMER' and you're on. (Booking fee of $7.50 applies.) Called up the box office immediately, and got my tickets.